I'm sure most of you have noticed that interest rates are on the rise. Have you asked yourself lately how the rise in interest rates might be affecting your home search? When rates rise, affordability goes down. Inventory levels also remain low and there are a lot of buyers out shopping right now. Are you ready? Below I have attached a link to a March 2018 article in Realtor Magazine that will help enlighten you. More interest rate hikes are expected for 2018. If after reading this article you or someone you know is ready to kick your home search into a faster motion, contact me right away. I'm here to help! Let me know if you have any questions. There has been a recent increase of real estate wire transfer scams, but you have the power to spot the warning signs before it happens to you. According to data provided by the FBI, in 2017, close to $1 billion was “diverted or attempted to be diverted” from real estate purchase transactions, and wired to “criminally controlled” accounts. That figure is up explosively from 2016, when the FBI counted $19 million in stolen funds. Scammers will use a loan officer, real estate agent, or title company email and letterhead. They’ll state that there has been a last minute change to where the money is transferred. Email will say checks are no longer accepted/money wiring instructions have changed. They’ll supply new account information for the transfer. Of course, none of that is true, but if the scammer is successful, their victim will send the money to the scammers account unknowingly, and the money is gone! Always call the closing company directly to verify wiring instructions before proceeding. If you are affected by wire fraud or suspect suspicious activity, call your local field office of the FBI immediately and visit www.ic3.gov, the bureau’s internet complaint center. Should I buy in the Fall?? Everyone knows the spring housing market has a reputation for being the hottest time of year to Buy a home. But what if it’s not the smartest time to buy? According to RealtyTrac’s fifteen year analysis of over 32 million homes, fall is the time of year to Buy if you want to keep cash in your wallet. On average, buyers pay 2.6% below asking price for their home. That could equate to a savings of thousands depending on your purchase price! Fall buyers also may have more negotiating power than their spring-time counterparts; desperate to Sell their houses before the holidays hit, sales prices drop around 2.96% on average from summer prices. Interestingly, listing prices stay the same, which suggests that buyers are able to bargain more during earlier months. This trend persists even though listings and competition, are down in the marketplace . Fall sellers need to Sell their homes quickly, and thus are willing to compromise in ways a more selective spring-seller would not consider. Shopping for a home toward the end of the year has other advantages as well. Black Friday sales are a great way to upgrade appliances and electronics in the home without breaking the bank. And with holidays looming toward the end of November and December, contract closing dates may go beyond the traditional thirty-day window to avoid closing on a major holiday. This can give you more time to pack, prepare and take some of the pressure off during busy times of the year. If you’re looking for a home and are worried that you will need to wait until next spring, perhaps it’s time to reconsider. You might find a killer deal that would otherwise be impossible later in the year! If you have questions or concerns about the home buying process, in the fall, or otherwise, give me a call today! If you’ve ever day dreamed about fixing up a property and turning it into you dream home, it might be time to consider purchasing a “fixer-upper.” Perhaps you’ve wondered if doing it is a good idea or not? Let me know if you want to discuss this possibility. It's certainly not for everyone. But for some, this can be a dream come true! Reason one is that most run-down homes, in need of renovation are great deals. While most people look at them and say, it’s not worth the work, you’re different. If you’re willing to put the work in, and the time and money, you could stand to get a great deal on a property in need of a little love. If you’ve ever wanted to create a living space just for you, then fixing up a home is right up your alley. If you would ideally like to have everything done to your taste, but can’t afford to build a home from the ground up, it can be a better idea to renovate a home. While building a home costs much more than the purchase of a home, buying a fixer upper and adding in a renovation budget, often costs much less. It can also take far less time, and stress. The other added benefit in making an out of date, run down or just older home, completely yours, is that you’re not starting from scratch. Rather than building a new home, you get to redesign an existing one. You get to choose how to preserve the character or history of the existing fixer upper. You never know what you’re going to find behind the drywall, perhaps original brick? Maybe you’ll find old wooden doors, that just need a little TLC before being incorporated back into the design of the home. It’s important to set realistic goals for yourself while considering a project like this. While you may think you can do it all on your own, it’s highly unlikely that you can or are even legally allowed to. Some projects involving plumbing, electricity, etc. will need licensed professionals to do the work. So it’s important to consider your renovation budget, and factor in what it will cost to pay contractors to do the rest. Give me a call if this is something that sounds right up your alley. A home that’s a little run down, but in a great location, could prove to be your dream home after a little work. Your home is one of the most important investments you will make in your life. You may plan to stay in your home forever, or you may intend to keep it for several years until you get a better job and can Sell it and move to a different home in a different neighborhood or even a different city. Regardless of why you have purchased your home, you need to maintain your investment. If your home looks good – you feel good. If your home gets run down, there will invariably be various hazards around the home that could injure you, your children, visitors, or even people just walking past. Remember that preventative maintenance is almost always cheaper than repair. Let’s start with the exterior of your home. Remove any trees growing within two feet of your sidewalks. Tree roots are quite powerful and they can actually push up your sidewalk from underneath – which will create dangerous areas where people can trip. Repair small cracks in sidewalks. Over time – and over the course of several winters when the cement will expand and contract, those cracks will deepen and widen until it will take a major repair job to fix them. And the deeper and wider these cracks, the more chance someone can trip, fall and injure themselves. Keep in mind that you are liable if someone trips on your sidewalk. Insure that your landscaping is graded in such a way that rain and irrigation water drains away from the house. Otherwise, water could drain toward the house and result in an expensive repair bill. Improper grading can direct water in to the crawl space, which can lead to mold. Depending on where your home is located – in a flood plain, for example – make sure you have a sump pump to help remove excess water before it gets into your basement. If you have siding, power wash it periodically to prevent mold and mildew from growing. Spores can enter into the home and cause illnesses. The mold and mildew will also damage the integrity of the siding over time. Keep trim and siding painted to prevent deterioration. Have your air conditioner and your furnace serviced annually. In the long run it will pay for itself in energy savings. All of your large appliances – from refrigerator to microwave to oven to dishwasher to clothes washer and dryer come with manuals. Make sure you go through these and learn what preventative maintenance steps you should perform on a regular basis. Each of these major appliances represents a substantial investment don’t throw money away by letting them deteriorate through neglect. Depending on how old your home is, it may not be equipped with smoke detectors in every room and, just as important, a carbon monoxide detector on each floor. You owe it to the safety of your family, any visitors, and even your neighbors to have working smoke and carbon monoxide detectors – and perform the simple maintenance of testing them once a month and replacing batteries once a year. By performing preventative maintenance, you will maintain the value of your home, save money in the long run, and enjoy living in an attractive and safe environment. Sometimes, it really pays to go against the crowd. As you probably know, spring is the season when most people put their homes on the market. Summer is the high season, and it’s when most homes get sold. And yet, there are a few powerful reasons why fall might actually be a better time than either spring or summer to Sell your home. It makes perfect sense when you think about it. By the fall, the bulk of spring listings are expiring. As a result, there is less competition, particularly when you consider the *NEW* label and the fewer days on the market that your listing will boast. Also, home buyers in the fall are more serious. They have been looking at listings for months, and they are eager to conclude their search and move in comfortably before the holidays. When you put those two things together, you get that homes listed in the fall Sell more quickly and often command a higher price. Now, if you are thinking of selling your home this fall, there are a few things you have to do differently. First, you have to prepare your home to account for the particular fall conditions. For example, you need to check the HVAC system and replace your furnace filter so your home will be warm and smell fresh. Also, make sure to turn on all the lights; you've got to compensate for the shorter, and sometimes cloudier days. Cleaning up the yard is also a must. Once you have an idea of what your home is worth, how should you price it? On the one hand, the fall is not a good time to start with a sky-high price. If you don’t Sell right away, you might not have time to adjust the price because of the smaller number of buyers and the shorter selling period (nobody wants to move over Christmas). On the other hand, those serious buyers I mentioned earlier might be willing to pay more simply because they’ve been looking longer and are more eager to Buy. It’s a balancing act. It’s also something I can definitely help you with. Give me a call at (541) 480-7441 if you are considering selling this fall, and I’ll give you my recommendations on how to price your home based on current conditions in central Oregon. Thanks and enjoy the Fall! 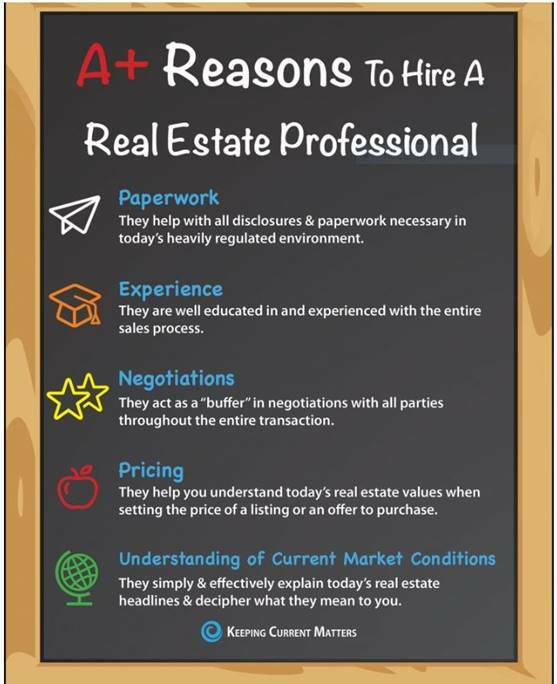 If you or someone you know is thinking about purchasing or selling a home or investment property, click on the following link to see the A+ reasons to Hire a Real Estate Professional. If you have any questions or need any assistance, please don't hesitate to call. I am here to help! I believe homeownership is the American Dream. When you Buy a home, though, it is important to understand the difference between what you want in a home and what you need. How can you tell the difference? The first thing I’d advise is pulling out a pen and a piece of paper and writing down two columns. In the left-hand column, list all of the things that you have today. In the right-hand column, list all the things you want. From left to right, your list should expand. This will be the criteria you will use to shop for a new home. Whatever amenities you end up listing in the right-hand column, it’s important to keep in mind that you may not get all of them in this next purchase. If your new home doesn’t have all the amenities that you want, I would strongly encourage that you start looking for ways to save money so that somewhere down the line you can procure them. I often see people make upgrades to their home solely as part of their strategy for selling it. This is a mistake—you’re spending money that you don’t get a dollar-for-dollar return on. If you’re making upgrades, do it for yourself first. Reap the benefits of how it contributes to the home’s sale later. If you have any questions you’d like answered, just shoot me an email or give me a call. I’d love to help in any way I can! Check your credit score. Get a copy of your credit report at annualcreditreport.com. The three credit bureaus (Equifax, Experian, and TransUnion) are each required to give you a free credit report once a year. Determine how much you can afford. Lenders look for a total debt load of no more than 43% of your gross monthly income (called the debt-to-income ratio). Make a down payment plan. Most conventional mortgages require a 20% down payment. FHA offers loans with only a 3.5% down payment. Prioritize what you most want in your new home. What's most important in your new home? Proximity to work? A big backyard? An open floor plan? Being on a quiet street? Research neighborhoods and start visiting open houses. This is where I can consultant with you to efficiently help find homes for you. Budget for miscellaneous home buying expenses. Start the good habit now of putting a little aside each month to fund maintenance, repairs, and home emergencies. Collect your loan paperwork. Banks are very particular when it comes to mortgage loans, so it's important to speak with a lender to determine what they will need to provide a loan. Get pre-approved for your loan. At this point, if you've been following this timeline, your credit score, paperwork, and down payment should be on track. Start shopping for your new home. Once you're pre-approved, I will be able to target homes that meet your priorities in your price range. Make an offer on a home. It usually takes at least four to six weeks to close on a home. If you or anyone you know has a question or needs assistance, be sure to let me know. I am happy to help!! If you rent a house, you're paying someone else's mortgage, and if you rent an apartment, you're probably just filling an investor's pockets with cash. Buying a home is a great way to spend money on your housing that actually builds equity. It's not only a home that you own, it's an investment, a great way to build future wealth, and a point of pride. Of course, you may want a home, but simply can't afford to Buy right now. You're definitely not alone. A recent survey by a personal banking firm reported that one in five Americans don't even have a savings account, and a significant portion of those that do don't even have a balance on that account. One of the hardest parts of affording a home is coming up with the down payment. In central Oregon coming up with 10% or 20% for a down payment may seem daunting, but it's not impossible. I've found these steps to be helpful for clients in the past who thought they'd never be able to come up with a down payment. 1. Set a target goal. Talk to a mortgage professional to find out how much home you can afford. That way, you'll know roughly how much you need to save for a down payment. Research shows that people who have specific dollar amounts in mind for a savings goal have a better success rate. 2. Assess your spending habits. Don't just make a rough audit of your monthly rent, utilities, insurance, and grocery costs. Really look into your monthly bank and credit statements from the last three months to see where your money is going. That will help you really find out where you can start to cut back. 3. Shrink your TV package. The average cable bill hit a record $99.10 last year. That's nearly 40% higher than the average from 2010! You can always - ALWAYS - call your local provider and try to negotiate a lower rate. If they have competition, use that as leverage. Also consider consolidating to only streaming services like Netflix, Hulu, and Sling TV. 4. Drop the gym membership. This could be tough if you frequent the gym - but many of us don't. Think about what you can do outdoors, and research some of the endless home workouts available online. 5. Unload your stuff. This can be done locally or online, of course. Even niche items can be sold with online services like Craigslist and eBay. You may not be sitting on a fortune of stuff that people will pay for, but in combination with other savings, it will make a difference. 6. Downsize your apartment. Moving from a one-bedroom to a studio could save lots of money without sacrificing too much space. This can also help you purge some unnecessary belongings, which can also bring in some more cash. A smaller space can also create savings in heating and cooling bills. Every dollar counts! 7. Get a side gig. You're probably thinking your 9 to 5 job is enough work, but think about opportunity cost. That hour you just spent watch the Kardashian's or the same episode of Sports Center after work is $10 you could have made pouring coffee at the local coffee bar, driving for Uber, or doing freelance work for services like TaskRabbit or AgentAnything. A couple night shifts or even a single weekend shift at a part-time job could contribute thousands toward your future down payment. 8. Open a high-yield savings account. If you're saving more or earning more with a new part-time gig, don't keep that money in your checking account where it's not accruing any interest. High-yield savings accounts offer daily access to money and accrue interest daily as well. 9. Get a cash rewards credit card. Ditch the no-frills credit card for one with cash-back rewards. It's an easy way to earn extra - if you consistently pay your bill on time each month. Credit cards typically have higher interest rates. 10. Save your tax refund. This is a nice yearly chunk of change depending on your work. If you can commit to socking away your tax refund, it'll be easier not to spend it when the check shows up. If you have more questions about how to save for a down payment, don't hesitate to ask me! I can help you find out how much home you can afford and what you need to do to reach your goal.